It’s great for the person who needs special physical placement. Original Price: $219.95. FINAL SALE – NON-RETURNABLE. We have the perfect tablet holder. It’s great for the person who needs special physical placement. 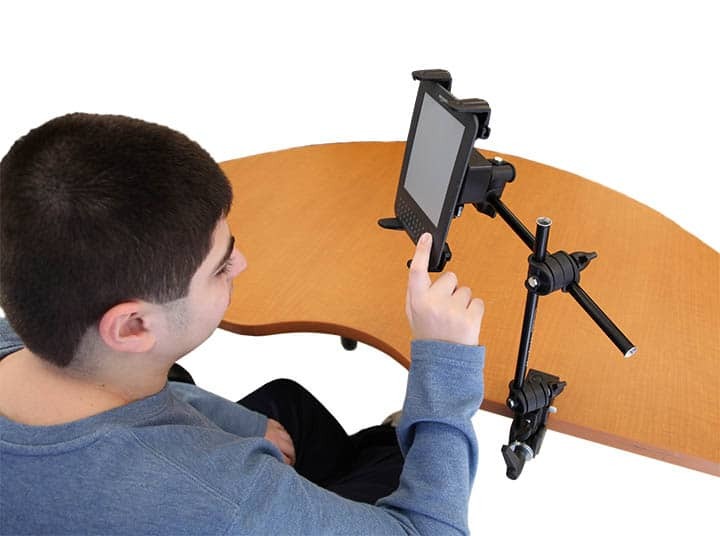 The mounting system easily attaches to a wheelchair, tabletop, bedrail or tray. Holder is compatible with most tablets and e-book readers including the iPad Mini, Kindle, Kindle Fire, Nook, Motorola Xoom, Samsung Galaxy Tablet, Asus Transformer and similar tablets. It comes with a set of six legs in different sizes to ensure a perfect fit without interfering with ports or functions. Holder size: 4¾”L x 1¾”H. Mounting arm expands from 14½” to 24″L. Q how much weight does it hold? A This would work for a tablet up to the size of a standard iPad (not any of the Pro model iPad's). Maximum weight 2 lbs.